For centuries, the world of Safehold, last redoubt of the human race, lay under the unchallenged rule of the Church of God Awaiting. The Church permitted nothing new-no new inventions, no new understandings of the world. What no one knew was that the Church was an elaborate fraud--a high-tech system established by a rebel faction of Safehold's founders, meant to keep humanity hidden from the powerful alien race that had destroyed old Earth. And now the fight is thoroughly underway. The island empire of Charis has declared its independence from the Church, and with Merlyn's help has vaulted forward into a new age of steam-powered efficiency. Fending off the wounded Church, Charis has drawn more and more of the countries of Safehold to the cause of independence and self-determination. But at a heavy cost in bloodshed and loss--a cost felt by nobody more keenly that Merlyn Athrawes. 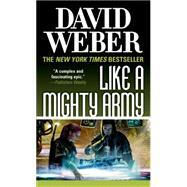 David Weber's Like a Mighty Army is the hotly anticipated seventh volume in the New York Times bestselling Safehold series. DAVID WEBER is the author of the New York Times bestselling Honor Harrington series, the most recent of which was Mission of Honor. He lives in South Carolina.